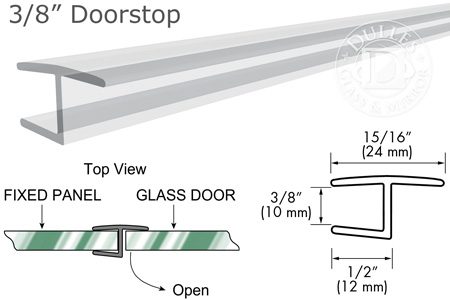 95" Clear "H" Jamb 180° Inline for 3/8" Glass-to-Glass Door is a Polycarbonate Jamb for 3/8" Glass. Recommended for use with Inline 180 degree Shower Door installations. Snaps onto fixed panel or door for glass-to-glass applications. "H" jamb for shower doors achieves a functional yet sleek look. Comes in ample length of 95 Inches. Keep the water inside your shower, while giving your shower enclosure a clean look. Clear Color. Polycarbonate material. Mfg. by Troy Systems in the USA. Shipped by UPS. Perfect for do-it-yourselfers.